To answer this question, we must first establish what I mean by “best.” Am I asking what player will be the most talented on the field at any given time? Or is it more about who excels the most at their position relative to the rest of the country? Perhaps the question would best be answered by choosing the player that most positively affects the gameplay of the team, like an MVP award? I don’t know. If I had known that I wouldn’t be able to get past the specifying stage of my question, perhaps I wouldn’t have even started writing this article (more wild speculation), but now I’ve begun, so I must finish. And since I am incapable of making decisions, I’m just going to answer all three questions. Who is the Most Talented Player on the 2018 Ohio State Roster? There are a lot of players to choose from when asking this question. Nick Bosa, Chase Young, Jeffrey Okudah and Baron Browning are all in the Top 10 of recruits in Ohio State History. The Buckeyes will have 9 247sports consensus 5-star prospects on their roster next year and will boast perhaps their greatest recruiting class of all time. Choosing the most talented player on this roster is like choosing the best of all of the bars of gold, or the tastiest of all of the Chipotle Mexican Grills, but I have to choose one and so I will choose the one that has proven it. Austin Mack has made some crazy catches. Isaiah Prince has stepped up on the offensive line. Dwayne Haskins, Tate Martell, and JK Dobbins all have a shot at winning the Heisman next year, but I chose the fourth highest rated prospect in OSU history. Nick Bosa is the highest rated prospect on the team this year and the one that has most proven what a Top 10 prospect can do. He spent last year fighting through double- and triple-teams, freeing up the other monsters on the defensive line, and making huge plays in the backfield. With Chase Young showing flashes of brilliance in his limited time on-field in 2018, the Little Bear might just have even more opportunities to shine this coming season. Who is going to win an individual award next year? This category is not quite as easy to deliberate on. Many of OSU’s best players come at positions that are stacked on the national stage. JK Dobbins could win the Heisman, but he also might not be the best running back in the Big Ten with his counterpart at Wisconsin, Jonathan Taylor, putting up huge numbers on the ground. All of this is without even mentioning the reigning Doak Walker award-winner, Bryce Love. Nick Bosa, Chase Young, and Dre’Mont Jones are all enormously talented on the defensive line. However, with players like Ed Oliver of Houston or Austin Bryant, Clelin Ferrell and Christian Wilkins, Clemson’s talented trio of All-Americans also back on the field, the odds of getting an individual award on the defensive line are not so great. His path to the Biletnikoff Award does seem a little bit… well, impossible, but watching the catches he made in 2017 and listening to the way his coaches talk about him, it really is impossible… to dislike him. Austin Mack will have to fight off upperclassmen trying to stay on the field, stand out in Urban Meyer’s run-first offense and catch passes from a brand new starting quarterback, but he has the talent and the upward mobility to be a first-round pick. 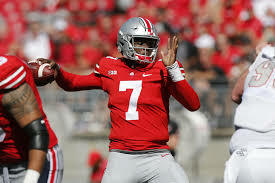 Hopefully, though, he will have a more pass-heavy offense to work with, as Dwayne Haskins looks to be the front-runner for the starting job and Ryan Day has been elevated to offensive coordinator. Who will be the 2018 Ohio State MVP? I only have one answer to this question, and it’s at the same position as it would be on any other team: QB. JK Dobbins will probably have a great year next year. The offensive line should be good. The defensive line will be unstoppable and Alex Grinch and Greg Schiano are going to figure out the rest of the defense. With all of that being said, the Most Valuable Player on this team next year is going to have to be the master and commander. I understand that we don’t know who the starting quarterback is going to be next year, but I do know that Dwayne Haskins looked the closest to being ready. 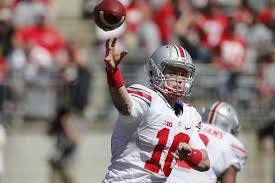 I also know that, in Urban’s Power Spread offensive philosophy, the offense runs through the quarterback. The Buckeyes success (or failure) next year is going to hinge on the quarterback’s ability to do what the coaches need him to do and how well he can develop as the season progresses. If Dwayne trots out there against Oregon State on September 1st, he has to be the MVP. With 11 minutes to go in the first half, the Ohio State Buckeyes went down 20-10 against Minnesota during the Big Ten’s Super Saturday. The best player in the Big Ten, Keita Bates-Diop, was struggling from the floor, and the OSU defense couldn’t handle Minnesota’s Jordan Murphy and his game down low. However, through their slump, the Buckeyes stayed committed to playing physical basketball and taking advantage of every opportunity. The very first points on the board came off a steal that led to an easy transition dunk for Bates-Diop. This was a preface of things to come, because, even though at times they weren’t getting the ball in the hoop, the Buckeyes continued to force turnovers. In fact, they ended the game with 10 steals and 22 points off of 15 Minnesota turnovers. Ohio State’s second made shot was a transition layup that was set up by a Sweet n’ Low bounce pass from CJ Jackson to Kam Williams. This was another fast scoring opportunity made possible, not because of outstanding offensive playmaking, but because they were playing smart, tough Ohio State basketball. The Buckeyes finished with 11 assists. The third score for the OSU came after CJ Jackson missed a 3 pointer from the corner. He followed his miss and came up with an offensive rebound that put him right next to the hoop with a wide open shot. Jackson’s floater put his team ahead 6-2. OSU finished with 12 offensive rebounds. Unfortunately, after a few layups underneath to make the score 11-10, the shots stopped falling. The Golden Gophers went on a 9-0 run and took their ten point lead. This left the fans that had made the long trek up to NYC wonder whether it looked like, perhaps, the Buckeyes didn’t have the magic. Maybe they were having an off day, or this talented Minnesota team was just finally finding their stride again. Maybe Ohio State had been overachieving for the last few weeks, and they were finally falling back to earth. Either way, OSU was struggling and their opponent was surging. Of course, we all watched the game so we know how it ends. The Buckeyes saved the first half doing the same things that they had been doing through the first 9 minutes of the game. They kept forcing turnovers, they kept making good passes, they kept getting rebounds, on both the offensive and defensive ends, and eventually, someone’s shot went in. All of the sudden the floodgates opened to reveal the January Buckeyes once more. Ohio State took the lead and then took a commanding lead and then they started dominating. A 10 point deficit turned into a 12 point lead and the score was 34-22. A 24 to 2 scoring run in which the Buckeyes dominated every facet of the game– shooting, defending, rebounding, passing– and they did it with Keita on the bench for 5 minutes. This team believes it’s one of the best teams in the country. After taking care of business at Rutgers, holding off a late surge from Northwestern, and obliterating Minnesota in Madison Square Garden, they come home with an 8-0 conference record and a top-15 ranking. Their four-game homestretch, starting tonight with Nebraska, comes at the perfect time, giving the Buckeyes an opportunity to flex their muscles against the middle of the Big Ten in preparation for what could be a Top-10 matchup at Purdue on February 7th. Chris Holtmann has put this team in a position to do something that they haven’t done since the 2012-2013 season: hold a top 10 ranking in January. If they win their next four games, they will own a 21-4 record, including a 12-0 start to conference play. Four games is a tall task, especially with the physicality of the Big Ten, but Ohio State has shown that it has the coaches, players and drive to do it. The next step is Nebraska, and then Penn State and Indiana and Illinois. Keita Bates-Diop has come back down to earth after his four-game “prove-it” tour, but Ohio State hasn’t. The Buckeyes are still dominating teams, still proving that they are not just “the surprise of the season” as every major sports publication is dubbing them. They want everyone to know that they aren’t overachieving. They are contenders. Their next step is Nebraska, but this Buckeye team has its sights set higher. 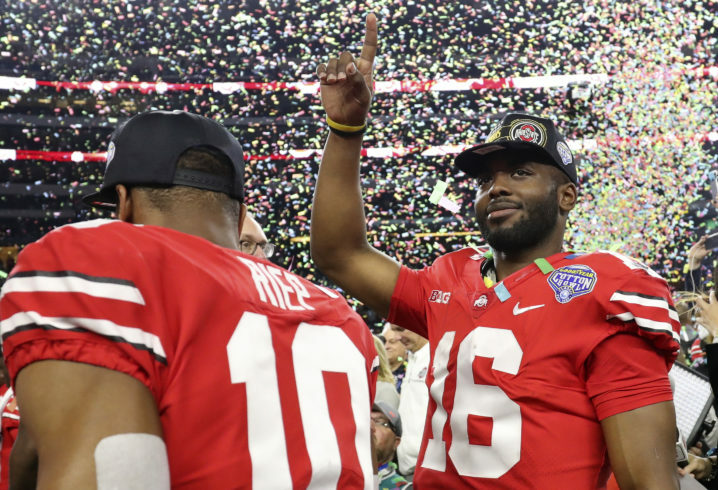 From the time the clock hit zeroes at the Cotton Bowl, the reality began to set in after JT Barrett’s last game in the scarlet and gray. The end was inevitable and you could see it on his face. Coach Meyer will be starting over in his quest for Barrett’s successor at the Quarterback position to run his offense to his liking and to the standard of previous starters. The age-old argument, of who should and shouldn’t be starting will die down, but for how long will the silence last? Barrett started due to his ability to flatly win ball games, no matter how pretty or ugly the win was achieved, he won them with his style of play. Now, we are looking at a changing of the guard that places four new hopefuls that are looking to succeed Barrett and catch Coach Meyer’s eye. It will surely be a battle and it will be fierce, but may the best man win. Haskins has the inside track in this quarterback battle, often spelling JT Barrett and earning the primary backup spot for the entirety of the year. He did pretty well and opened some eyes during both, mop up duty and during the TTUN game where he rocketed a pass through defenders, for a sorely needed first down conversion while Barrett sat out with an injury. Haskins has the arm strength, which is why I’d say half Buckeye Nation fans were adamant and just downright negative about Barrett remaining the starter. He is a decent runner, but he isn’t as fleet-footed as JT, but there will be no need for that many QB runs this season because Haskins can fling it with accuracy and velocity. Barrett is now out of the picture (God bless his heart) and now hopefully Haskins learned from him during his time there. The offense under Haskins will be scary if he figures it out early and with a full complement of Zone 6 returning for one more go, along with both Tote Nation stars, the balance will return to Ohio State. It will only be a matter of time. Burrow is a bit of a wildcard in this equation. He led early as for backup duties, but an injury to his hand cost him in the end. There have been rumors about a potential transfer, but nothing has been confirmed, yet. Like Haskins, he can throw and is just as accurate, but during spot duty, he was up and down during those games. He isn’t terrible, but this spring game will be fun and it will tell a lot about both competitors. Personally, I don’t think a transfer is in the cards just yet, and even if he becomes the backup, he will stay until he graduates, then becoming a graduate transfer would be in the cards. This is just my opinion, so don’t shoot the messenger and I have no inside knowledge, just thinking logically. Martell is another wildcard in the quarterback competition. His skill set is pretty similar to JT, being a dual-threat, but he can throw better. Tate is shifty and he is deadly accurate when he is set or on the run, which makes him the dark horse this spring. Martell went out on a limb and pretty much guaranteed a CFB Championship game berth next season. I think if the teams gels quickly, it is definitely possible, but with CFB, you never truly know what will happen. They all just need to focus and play hard every single game, and whatever happens, happens. The goals are set and it is up to the team to put their nose on the grindstone and work for what they want to achieve. Baldwin will be the new kid on the block and he will most likely see a redshirt year, to be honest. He suffered a major injury during the playoffs, and I am positive that the injury would not be completely healed. 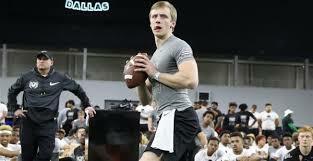 After viewing his Hudl footage, this kid is a beastly addition to a talented quarterback room. He can throw from everywhere on the field and is deadly accurate. I was in awe and I was pleased that the coaches took him over Emory Jones, who was committed until things happened. Things happen for a reason, but we got another gem in the rough. This battle is far from over, but this year’s competition will be one to watch because the future of the program is at stake. You cannot go wrong with any name in this talented quarterback room, but one will win out in the end. Each signal-caller brings an arm and accuracy, with decent mobility with the exception of Martell and Baldwin. The passing game and balance will be the focus this year, with fewer quarterback runs. It will be an exciting change for the team that is looking for a new leader. Ohio State Football: The Sinister Six? Six names. Six pass catchers. Six young men that spent all of last year running around the field decked in Scarlet and Gray, waiting for passes that would never come. Not one of them was in the Top 80 in receptions last year, or in the Top 100 in receiving yardage or yards per game. On an Ohio State team that was tied for third in the country in Passing Touchdowns, there was not one receiver that a generic college football fan would recognize, not one receiver that would be worth a look until at least the 4th round of the NFL Draft. So today, I am going to examine our beloved “Zone 6” from recruitment until now and see if it isn’t more of a Sinister 6 (for those of you who don’t know, the Sinister Six are a group of Spiderman bad guys that teamed up and then got their butts whooped one-by-one). H-Back – 6’1″, 208 lbs. WR-Z – 6’1″, 204 lbs. WR-Z – 5’11”, 195 lbs. On Sunday, January 7th 2018, the Ohio State Men’s Basketball team defeated the top ranked Michigan State Spartans. When asked about the upset, OSU’s coach, Chris Holtmann, responded, “It is hard to win on the road, especially when you have that kind of number by your name. You get a different look from teams.” That ‘number’ he was referring to was the tiny 1 that could be seen next to Michigan State’s name throughout the game’s broadcast, and the point he was making was that, when people know you’re the best, your opponents play you harder. Coach Holtmann knew this fact from experience, himself watching his own Buckeyes give the AP’s number 1 ranked team in America all it could handle, and then some. From the beginning of the season, when they were selected by some to finish as low as 14th in the Big Ten (out of 14), this undervalued and overlooked team had been playing with a chip on their shoulders. In fact, when asked whether OSU’s quick conference start surprised him, Senior Jae’Sean Tate told the press that he and the other players “always remind ourselves that we were last picked in the Big Ten… and I think that has really been a key to our success.” This slight drove them to become a team that played with ferocity—that played their tough and scrappy game no matter the opponent. As far as any of their opponents knew, this was a team of misfits—a roster filled to the brim with walk-ons, transfers, busts and guys who just couldn’t stay healthy; but from the beginning of the season, they started proving people wrong. In an early season matchup against a tournament-level Butler team, they showed flashes of dominance that belied their humble exterior, but a last second comeback by the Bulldogs kept OSU in the shadows. Another opportunity for some notoriety came in the ACC-B1G Challenge, but, once again, a late-game collapse against the now-ranked Clemson Tigers stole the spotlight away. They had some losses, but they were hunters still. Luckily, after missing two other opportunities at signature wins against Gonzaga and UNC, their prey had finally arrived. It came in the form of the aforementioned Spartans, a team on a 14-game win streak, standing atop the College Basketball world. Ohio State went into that Sunday night showdown the hunters, but they came out the hunted. A home game against Maryland in which they were down by 9 at the 11 minute mark of the 1st half proved that they were no longer a team that would be overlooked. At the end of the game, Maryland’s Coach Turgeon said, “We knew we weren’t getting the same shot that Michigan State got at the start of the game,” and so the Terrapins came out swinging. The Buckeyes didn’t have that same fire to start off, the way they had against the Spartans, but after a quick timeout by Coach Holtmann, Maryland got buried, going from up nine to eight down in less than 4 minutes, and that was pretty much the end of the game. After surviving their first test as the hunted, the Buckeyes had to go on the road against Rutgers, a physical, defensive team that had just barely failed to do what Ohio State did in knocking off Michigan State. This time, though, the Buckeyes would have no home crowd. They would be playing on regional television in a game that Rutgers would surely be up for after such a great performance in the previous week. However, once again, the Buckeyes were up to the challenge, beating Rutgers 66-46. Holtmann said after the game that they “are going to have some people that will play with a different edge” and that they would “see if we are good enough to manage that.” Another test passed. Another hunt escaped. Of course, for all of their impressive defensive statistics, Rutgers is currently 1-5 in conference and tied for 12th in the standings. Tonight, the Buckeyes face off against a much better team in their arena and on their court. Northwestern, a team that made the tournament last year and then had the nerve to return 4 starters, has been slumping for the better part of this season, but they do have the talent to compete with Ohio State. The game between these teams is going to be Big Ten basketball at its finest, and the Buckeyes are going to have to grind it out. OSU has proven that they have the goods to play with the big boys. They have proven that they can come back at home and take care of the conference’s not-so-good teams on the road. Now they’ve got to take it one step further to prove they deserve to be at the top of the Big Ten. They have to beat a good team on the road when that team is preparing specifically for them. This is just the next test of many to come as they seek to close out the season strongly. Tonight they have a chance to pass another milestone for this once-unheralded Buckeyes team and to add to their tournament resume, only this time, they’re the ones with the number by their name. It has been mere moments since Andre Wesson put the nail in the coffin against a solid Rutgers defense (not so much with the offense), and it’s occurred to me that there may be a good metaphor for this Buckeyes team. Early in the broadcast, the commentators were talking about Jae’Sean Tate and how he is a do-everything type of player, a Swiss Army Knife, and, while that is a good description of what Jae’Sean does for Ohio State, it is an even better metaphor for the Basketball Buckeyes as a whole. This team is a Swiss Army Knife. Now, I obviously don’t expect you to believe me without any evidence, so to prove it to you, so let me give you some numbers. (Prepare yourself for Too Much Information.) The Buckeyes’ offense is the 28th rated team in KenPom Adjusted Efficiency and their defense is rated 30th in Adjusted Efficiency. There are only 9 teams in the country— including Ohio State— that are rated in the Top 30 nationally in both categories. According to teamrankings.com, the Buckeyes are 19th in Shooting%, 28th in Effective Field Goal % and 32nd in True Shooting % while remaining in the Top 75 in all defensive Shooting categories. They are in the Top 30% of all teams in Block Percentage, Top 20% in Rebound Rate, Assists per Game and Assist/Turnover Ratio and they are among the best in the nation at not allowing opposing teams to get easy points in the paint. What all of those statistics mean is that this is an adaptable team. Against Michigan State, we saw this Buckeyes team not allow Sparty to penetrate the lane or get anything inside, forcing a team that was struggling shooting from the field to take a lot of outside shots. OSU also took advantage of Michigan State’s tendency to turn the ball over, forcing 12 TOs and making the most of transition scoring opportunities. They did all this while still playing their basic, high-effort man-to-man defense. The next game, against a Maryland team missing important playmakers, they held firm on defense through a slow start shooting until they were able to get better, more open looks. From there, they scored and scored while the undermanned Terrapins had no offensive response. The Buckeyes tied the school record for most 3 Pointers made in a game with 17, and 8 different players made at least one shot from beyond the arc. Tonight, against this stingy and plodding Rutgers defense, the Buckeyes slowed everything up and locked down the inside, forcing one of the worst shooting teams in the country to dribble around for 25 seconds and then throw up deep 2s and 3s all night. With three unique victories against three completely different teams, Ohio State is showing itself to be a matchup nightmare. This team is showing itself to be a Swiss Army Knife that can find your weakness and take advantage of it, or that can beat you at your own game. They have CJ Jackson, who is just like the tiny knife on the backside of the tool, swooping in for layups, assists, and rebounds. They also have Keita Bates-Diop, the big main knife that will cut you to the bone if you’re not paying attention and can be used for many things. Not to mention they’ve got Micah Potter; he’s that curvy thing that looks like a bottle opener, but it can’t be because there’s already another bottle opener, so you just use it to pry things. There’s a little something for every situation with these Basketball Buckeyes, and the more I see of this team, the more credit I give to the Coach. Holtmann has molded this team into something competitive and fun to watch, which brings me to my overreaction: Ohio State is not just a tournament team, they are a good tournament team, and they are a dark horse to make it to the Final Four THIS SEASON. If they can get past Purdue, they might even be able to win the Big Ten too. As the clock reaches zeroes and the confetti pours down from above, an Ohio State legend gallops into the sunset after his final game donning the scarlet and gray. It is surely, a bittersweet moment amid an average performance by JT Barrett, but the emotions of this final moment will vary among the fan base. Two sides of the same coin, the intensity of the arguments can be felt across the nation, and it suddenly turns Buckeye fans against each other, when we should be celebrating his accomplishments and what he has done for the team–instead of nitpicking at his flaws. JT Barrett has done so much for the university, and yes, while championships are the goal, sometimes the season just plays out differently, leading to the team underachieving, but that is football for you. Sometimes it does not go your way. Do not let the lack of championships obstruct your view of JT and his accomplishments because he has done more in his five-year stint at Ohio State than most players that played the position. 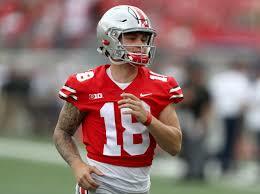 He has more wins than any other Buckeye signal caller, after besting Art Schlicter’s age-old record for wins with his 44th win as a starter against 6 losses, and he was the only Buckeye to go 4-0 against TTUN. As mind-boggling as it has been through the years with his ups and his downs, his strengths and his weaknesses, he still managed to win. It wasn’t always pretty, and he always took over when he had to, but he flat out played to win. Unfortunately, a small portion of the fanbase is unwilling to appreciate his efforts often pointing to the Iowa game, where the offense under Barrett struggled mightily as they were blown out by 31 points. This 31 point loss was the deciding factor that put eventual Champion Alabama in over Ohio State. Ever since that loss, the appreciation was not the same for Barrett or the team. This is what is so frustrating about our fanbase–they are too spoiled and they expect too much to the point to where it is unrealistic and unattainable. You cannot expect Ohio State to win every game, you cannot expect the home teams to just lay down just because your Ohio State, and you cannot expect them not to give you their best shot when you come around because you are a brand name in CFB–a blueblood program. Iowa definitely dished out the haymaker or knockout punch in the beginning, and it all just went downhill from there, but the team fought tirelessly until the end. Yes, the playcalling caters to Barrett’s strengths and they are semi-conservative. There is no pop or explosiveness to the offense. He was inaccurate and inconsistent, the playcalling was limited and uninspiring, they forgot about their RB’s, and they often called nothing but short passes and RPO’s that often lead to Barrett rushes for the rest of the season. I get it, I fell in love with the Buckeyes in 2006 during my first enlistment in the Air Force coming in from Guam, during the Troy Smith era. They had so much excitement and explosiveness on offense, it was always a treat to watch them shred teams with their unpredictability. I miss it, but it is a different era, different Quarterback. Hopefully, the next man up will provide the same spark on offense, but we need to take the time to appreciate his accomplishments and achievements during his time as a Buckeye. There is no more need for slander because he is gone. He has done too much for us to go out with negativity like I have seen. He is a Buckeye, he was a great leader, a competitor, a winner, and a legend. Let JT Barrett ride off into the sunset in peace. Send him off on a high note and let his memory bring you joy instead of pure vitriol for what he failed to do and just focus on the positives. I know that this won’t change the overall perception or view of Barrett, but I have had enough of the negativity. It was fun while it lasted, but the next man up will take over another deep and talented offense. Thank you JT for all you have done, God bless you and I hope that you succeed at the next level, whether it is as a player or a coach. Go Bucks! With three and a half minutes left in the first half and the Ohio State Men’s Basketball Team up on Maryland 34 – 24, Senior Forward Jae’Sean Tate drove into the paint from the right wing. The defense collapsed, leaving former walk-on and former Wolverine wide open for three in the corner. With an opportunity to shoot, Andy Dakich, the graduate transfer from Michigan, took it and drained his third triple of the night. The trio of 3 pointers gave him the same amount against Maryland as he made during his entire 3 year career at Michigan, while also putting Buckeyes up 13 in a game they would go on to dominate in the second half. The Ohio State possession I just described is indicative of what this team has grown to become over the last few weeks. There is no argument over who the best player is, nor is there an argument about the amount of talent on the roster. Forward Keita Bates-Diop, the Big Ten scoring leader, is now in many minds the favorite to win Big Ten Player of the Year honors, but after Keita, there doesn’t seem to be any clear NBA-level talents on the roster. This general lack of elite talent means Ohio State should have issues matching up against top teams, and in the early part of the season we saw exactly that play out. The Buckeyes could not keep up with teams like Gonzaga and UNC. They struggled to string together stops and to make the tough shots. The other issue that gave many fans doubts about this team was a serious lack of leadership over the past two years. Throw in a controversial head coach firing and the late hour at which it occurred and you get a team that many were worried could struggle with identity, decision-making, mental toughness or any number of off-court issues. The early losses to Butler and Clemson, both coming after holding double-digit leads late in the second half, seemed to confirm our suspicions that this would be a rebuilding year. Everything seemed to be pointing toward another unexciting season for Ohio State basketball, except one thing… They beat everybody else. There were no losses to Florida Atlantic. There were no losses to UT Arlington or Louisiana Tech. 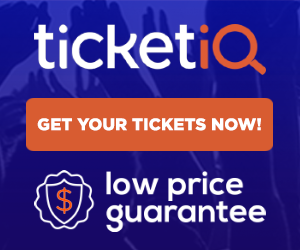 Even more impressive were their early season Big Ten wins, handing Wisconsin its worst loss ever in the Kohl Center, 83-58, and then beating a solid Michigan team at home. After a loss to #5 UNC in the CBS Sports Classic, the Buckeyes beat Miami (OH) and Iowa, and entered a matchup against the #1 team in the country with an undefeated conference record. The team had done what it needed to do. They weren’t surprising anyone too much yet, but, if you were really paying attention, you saw a team that was gelling. They had their ups and downs, but under Head Coach Chris Holtmann, they were improving every single game. And so, the Basketball Buckeyes beat #1 Michigan State. The reason they won is the same reason why this team is so much fun to watch. They did it with the little things and one big thing. This team is a team that plays hard on every play. They fight for loose balls. They clog up passing lanes. They make the extra pass on offense and they’re all learning to take the open shot. Of course it helps that they have a Keita they can feed when no one else’s shots are falling, but against Michigan State and again against Maryland the reason Bates-Diop was so extremely effective was because players like Kam Williams, CJ Jackson and even Andrew Dakich were stepping up to make plays when the defense sold out to stop their star player. Over the last couple years, the complaints piling up against this team were many, but most of them boiled down to a team that didn’t care. This team plays like they care, and when good teams play like they care, they win games. It also helps that Andy Dakich is draining threes. With Mike Weber hinting at a return for one more year with the Scarlet and Gray, we can now officially continue one of the most interesting debates of the 2017 season: can Mike Weber and JK Dobbins co-exist in Ohio State’s offense or will 2018 turn into a Fast and Furious style race to the finish? Conventional wisdom tells us that a team can never have too much talent, however, as we saw with the JT vs. Cardale debacle in 2015, the outcome of games is not based on how much talent is on the roster, but on how that talent is managed. Over the course of the last 6 months, we have all been witness to the unfolding of a new saga. On one end of this story, we had the grisly veteran with a growling v8 under the hood. Here was a guy who had replaced an all-time great and was fresh off a somehow under-the-radar 1000 yard freshman season, but who was battling a preseason injury. On the other, we had an untested, yet highly rated true freshman powered by an imported prototype hybrid V12 engine, who had fought his own injury troubles to get onto the field. It was under these circumstances that Ohio State’s season began, with JK Dobbins thrust into the limelight, an inexperienced starter with no veteran backup options. Dobbins exploded onto the scene, with 29 carries and 181 yards in his first ever start. This freshman revelation led many to wonder what the coaches were going to do with Weber when he returned from injury. Was he going to lose his starting job or would he be slotted back in and pick up where he left off in 2016? When Mike Weber returned to the lineup, it was immediately apparent that he was not being used in his former role. He still wasn’t 100%. And so, as the weeks continued along and the games in which he didn’t play (or was severely underused) piled up, a lot of fans forgot about Mike Weber as we were being wowed by this young, prancing colt in JK Dobbins who was galloping up and down the field. What we were seeing in Weber was a young man with a rugged and classic style of running who had been outshone in his first year as a starter by the versatility and game-breaking ability of Curtis Samuel and now in his second was being overshadowed by a true freshman that seemed like he had electronic traction control and lightning in his shoes. Of course, the season didn’t end after the UNLV game, and Weber returned during the cupcake section of the Buckeye’s schedule. In these games, it seemed like Urban, Kevin Wilson and Tony Alford were content to use the two backs in the exact same role, just trading them out every quarter to make sure they both had fresh legs in the 4th. However, they were still growing into their own roles in the offense. Dobbins was able to create plays in the run game, and opening up holes for quarterback JT Barrett while in scoring position. Weber found his yards in between the tackles and in short yardage situations, including on the goal line. These new roles showed in the statistics, as Dobbins averaged 85 yards per game and had 4 touchdowns over the first 3 games of the Big Ten Schedule. In the same time frame, Weber averaged 61.7 YPG and added 4 touchdowns of his own. Bam! Ohio State had found its offense on the backs of two horses at tailback, one that could weave and one that could roar, and a quarterback that would take anything the defense would give him. What we thought we were seeing was a clearer definition of roles, however, both the Penn State and the Iowa game proved that no one really had any idea what this Ohio State team was. What these games did seem to show, each in their own way, was that Dobbins was becoming the clear number one tailback and Weber was once again fading into the background. This all lasted about a week until we were all once again proven wrong. In the Michigan State game, the entire country saw what this Ohio State offense was supposed to look like under Urban Meyer and Kevin Wilson: a three-headed rushing attack with JT Barrett, JK Dobbins and Mike Weber pounding the front seven of opposing defenses along with weapons on the outside to keep the defensive front honest. It was an offense in which you could try to reign in the horses, but one would always break free. The Spartans could attempt to stop Dobbins, and so they were gashed by JT. Then they tried to stop JT, and Weber was able to run free like a stallion down the middle of the field, breaking touchdown runs of 47- and 82-yards. Both Dobbins and Weber had a great game, Dobbins as an every down type of back and Weber as a change of pace battering ram with surprising, yet elite top end speed. All Ohio State got out of it was a 48-3 victory over a Top-15 team. This was the team everyone was expecting when Kevin Wilson was hired in the offseason. The Illinois game saw Mike Weber take another step forward in production, once again outgaining Dobbins in a blowout, however, after playing reasonably well against Michigan, something seemed to change for the coaches. After averaging 10+ carries and 100+ yards as well as more than 1.5 TDs per game over the last 3 games of the regular season, Weber had 4 carries for 6 yards in the Big Ten Championship and 5 carries for 18 yards in the Cotton Bowl. Granted, Wisconsin had one of the best defenses in the country in 2017 and USC sold out to stop the run game, but even so, JK Dobbins had 17 carries for 174 yards against Wisconsin and 13 carries for 39 yards against USC. The coaches had apparently made up their mind about what Mike Weber was and is. Basically what we’re talking about are two completely different runners, like two different sports cars. JK Dobbins is an Italian import– a Ferrari– agile with some freakish off the line get-up-and-go. Like the Ferrari, he takes the corners extremely well and can excite you every time he fires that engine up. Mike Weber is a classic American muscle car– a Mustang– powerful and gritty, but when you open it up, fast as the wind. He was built for the quarter mile and he’ll fly if he’s got room to go, but he’s not as fancy as the Ferrari in the corners. And now, with Demario McCall and the newest model, Jaelen Gill, looking like they’ll be pushing for touches, along with Antonio Williams and the highly touted freshman tailback class that the coaches brought in for 2018, Urban’s garage is getting smaller and smaller. The problem is, Ferraris are made by a racecar manufacturer with racing technology, while Mustangs are made by a truck manufacturer. Unfortunately for Mike Webber, it looks like Urban is going to try to ride his Scarlet Ferrari to a National Championship in 2018.